Mard Ko Dard Nahi Hota(MKDNH) (transl. 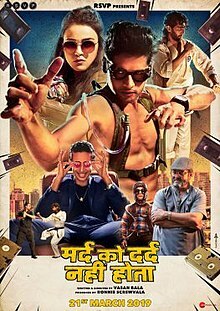 and internationally The Man Who Feels No Pain; Hindi pronunciation: [məɾd̪ koː d̪əɾd̪ nəɦiː ɦoːt̪aː]) is a 2018 Indian Hindi-language action comedy film written and directed by Vasan Bala and produced by Ronnie Screwvala under his banner RSVP Movies. The film stars debutant Abhimanyu Dassani, Radhika Madan, Gulshan Devaiah, Mahesh Manjrekar and Jimit Trivedi. The film premiered in the Midnight Madness section of the 2018 Toronto International Film Festival, where it won the People's Choice Award: Midnight Madness. The film was also screened at the 2018 MAMI Film Festival where it received standing ovation. The film's story follows a young man who has a rare condition called Congenital insensitivity to pain and strikes out on a quest to vanquish his foes. Bhagyashree's son Abhimanyu Dassani is making his acting debut with the film. The film was released in theaters on 21 March 2019 and received exceedingly positive reviews from critics. Surya is born with a strange condition under tragic circumstances. He is diagnosed with a rare medical disorder called Congenital insensitivity to pain and is tended to by the odd-couple combination of his father and his mischievous grandfather Ajoba. School life is difficult for a boy who doesn’t get hurt and is picked on by bullies and, yet, Surya finds an unlikely ally in his neighbour, Supri. At home, Surya learns to tend to his own wounds and binges on a whole host of martial arts films on VHS tapes thanks to his grandfather’s unique tutelage. The one tape that mesmerizes young Surya is 100-man karate kumite fought by a mysterious one-legged man called Karate Mani. His first foray into vigilantism is to come to the aid of Supri against her abusive father, but that event leads to the family being evicted from the building they lived in, and Surya and Supri are estranged as children. They go their separate ways, each one finding purpose and mentorship in unusual circumstances. Ajoba encourages Surya to pursue his passion secretly & Surya trains himself by watching VHS videos meanwhile, Supri is trained by Karate Mani who had earlier rescued her from the railway station. As an adult, Surya remains as dorky as he was as a child because his father will never let him leave the house. When his father finally agrees to let him outside, Surya finds a poster advertising his childhood idol Karate Mani. This poster leads him to the very building where he and Supri had been separated years ago & it is Supri who is pasting the posters. Both of them don't recognize each other, but he is bedazzled when she fights off thugs to rescue a lady. Later Surya visits the said address mentioned on the poster to meet Karate Mani. He finds him in knocked out by his evil twin Jimmy & his assistant calls Supri to help him. They take him to a hospital, where only Supri & Surya are left when rest of them leave on some pretext or the other. Later Supri is forcefully taken away from the hospital by her boyfriend Atul & Surya fails to understand why she didn't fight back. Later when Mani recovers consciousness he escapes from the hospital feeling that hospital will bill him a bomb for trivial treatment. Surya chases him & fights off the hospital staff who had come to capture him, Manis is impressed with his skill & reveals his story. It is later revealed that Mani & Jimmy were trained by his father, a Karate trainer since they were kids. Mani showed that talent for martial arts & easily won the heart of his father which made Jimmy jealous. One fine day Mani saves Jimmy from a speeding truck, sacrificing his leg in the process. This further elevates Mani in the eyes of his father & Jimmy is further estranged. After the 100-man him, his father takes gifts him his locket, whereas Jimmy takes up the path of crime. Once jailed for one of his crimes, Mani gets cozy with Jimmy's girlfriend & Jimmy catches them red-handed in bed when he returns. This incident creates a permanent rift between the two, putting Mani in a guilt trap. Later Jimmy starts a security agency & bully's Mani with men & guns of his security agency, taking something from him each time he visits him, while Mani relents out of guilt. Supri later reveals that Atul won over her parents by taking care of their medical expenses, which sort of forced her to stay with him so that her mother would get adequate medical care. Atul is taking her family to Canada to treat her mother. Supri is falling into the same trap of family burden as her mother bore all her life with an abusive husband. So much so that she doesn't have time to think for herself & no clue of what she would do in life or what career she would pursue. On his previous visit, Jimmy snatches locket that was given by their father to Mani & Surya vows to get it back for him. His grandfather tries to dissuade him as it is too dangerous but eventually gives in when he realises that he should not kill this very motivating factor. When Surya meets Mani, he refuses to take him to Jimmy but when Surya stops at nothing he accompanies him to Jimmy's office. Meanwhile at the airport just before boarding their flight to Canada Supri's mother insists that she run away from Atul so that she doesn't go through the same fate of an overbearing husband. She hatches a plan wherein she would cover up for the absence of Supri inside the plane & would fall unconscious with a heavy dose of insulin once the plane lands in Canada. Once unconscious at the airport she would have to be admitted to hospital & she would get treated. Supri leaves after some pushing from here mother & goes straight to Jimmy's office, knowing Surya would create some ruckus there. Here at the office of Jimmy, a fight ensues between his staff & the two. Surya easily thrashes most of them & they are surprised to find that Surya doesn't experience the pain which makes him more lethal. In the ensuing fight, fire is triggered & the staff members lock them in a room & escape from the building. Supri enters in a nick of time & rescues them. They later take refuge at their old residential complex, where they had spent their childhood, which is deserted for reconstruction & Ajoba gets them all the essential stuff like blanket & food. Early in the morning, they are all captured by Jimmy & he arranges a cruel game, where each one of them has to fight his staff members one-on-one. The first turn is of Mani, followed by Supri, Surya & Ajoba. Supri & Mani knock down a quite a few men before going down. All of them attack Surya barring one & Surya knocks them all. Mani then sends his last remaining fighter who is his best one. Just to quickly end the contest, he changes the rule. A 10 point match where a point is scored with every hit. Surya is injured when his foot is fractured by his opponent. Mani throws his crutch for help. Surya decides that it is time to break the rule & hits his opponent close to the eye with the crutch temporarily blinding him & finishes off the match. Jimmy is enraged at this & shoots & stabs him. Supri intervenes, snatches the gun & shoots him dead. Later Surya wakes up at his home, turned hospital. Supri & Ajoba are next to him. Mani is revealed to be in jail, who owns up to the murder of Jimmy. Surya goes on to full fill his father's aspiration & becomes an accountant. Supri mother gets treated in Canada. Now liberated from the burden of her mother's treatment, she finally starts thinking of her own self & starts focussing on her career. Director Vasan Bala said that in early 2016, a friend of his told him about a dentist whose patient did not ask for anaesthesia. This triggered the idea of the film to him. He then saw several documentaries and blended it with his childhood stories about martial arts. He said: "The story is about all the films that I grew up on, Bruce Lee, Jackie Chan [..] all the karate classes I had to take." Bala said that the film is a tribute to "all the films that we have seen." For the preparation of the role, Dassani trained for martial arts for three months before the audition. He also practiced swimming, gymnastics, yoga, free hand training, stick fighting and studied human anatomy, injuries and first aid. Action director and martial arts consultant Prateek Kumar made in acting debut with the film, he also served as the martial arts consultant. Dassani went through one-and-a-half month of auditions with other people. Devaiah learned karate while Madan and Abhimanyu learned mixed martial arts. All of them went through almost eight months of training. Madan mentioned that she was auditioning for Laila Majnu (2018) when got to know about Mard Ko Dard Nahi Hota and chose the latter film because of its "uniqueness". She performed all the stunts herself and watched several classic action films for days to famliarise herself with the genre. She was also injured and bruises while the physical training; she also followed a strict diet and a daily routine of exercises. The official theatrical poster of the film was unveiled on 11 February 2019. The film is slated to release on 21 March 2019 by Zee Studios. The official trailer of film was released on 8 March 2019. The music of the film is composed by Karan Kulkarni and Dipanjan Guha while the lyrics are penned by Garima Obrah, Karan Kulkarni, Shantanu Ghatak and Hussain Haidry. On Rotten Tomatoes, the film has scored 100% based on 5 reviews with average rating of 6.5/10. Rafael Motamayor of Bloody Disgusting called the film "India's highly entertaining answer to Deadpool". J Hurtado of Screen Anarchy wrote: "In this boisterous action comedy, Bala's passions and obsessions are writ large across the screen with a genuine affection that is hard to deny." He later included it in his list of 14 Favorite Indian Films of 2018. Joe Leydon of Variety wrote: "Writer-director Vasan Bala’s wild and wacky yet also warm and fuzzy fable about a resourceful young man who transcends ostensible physical limitations to become a two-fisted, swift-kicking hero likely will prove to be an irresistible crowd-pleaser on the global fest circuit, and in international release on various platforms." For Scroll.in, Nandini Ramnath writes, "Vasan Bala’s action comedy, which he has also written, plays out at the intersection of cinephilia, nostalgia and mischief." Stephen Dalton of The Hollywood Reporter called it a "fun ride, unashamedly zany and eager to please, even if the humor is very broad and the sprawling plot too baggy for an action-driven piece." Rahul Desai of Film Companion called it "a Whimsically joyful ode to a life of movies." Pradeep Menon of Firstpost wrote that the film "remains watchable throughout, despite all its shaky foundation, precisely because it gives us an experience we rarely see in Indian cinema." Devesh Sharma of Filmfare giving three stars out of five says, "All-all-all, the film’s gags don’t travel well outside the context. It’s one of those -- ‘you’ve to be there’ -- kind of films. But within those two hours, you’ll surely laugh your head off." Raja Sen of Hindustan Times giving four stars out of five feels that the film is most entertaining action movie in decades. ^ "Mard Ko Dard Nahi Hota Box Office". Bollywood Hungama. Retrieved 7 April 2019. ^ "Vasan Bala's 'Mard Ko Dard Nahi Hota' to be premiered at Toronto film festival". Scroll.in. 10 August 2018. Retrieved 17 August 2018. ^ "Vasan Bala's 'Mard Ko Dard Nahi Hota' to premiere at TIFF". Business Standard. 10 August 2018. Retrieved 17 August 2018. ^ Singh, Suhani (17 September 2018). "Mard Ko Dard Nahi Hota wins audience award at TIFF". India Today. Retrieved 4 October 2018. ^ "A full house: 'Mard Ko Dard Nahi Hota' gets standing ovation at MAMI Mumbai Film Festival". The Economic Times. 27 October 2018. Retrieved 28 October 2018. ^ "Bhagyashree's Son Abhimanyu Dasani Can't Feel Any Pain in Mard Ko Dard Nahi Hota Trailer". CNN-News18. 17 August 2018. Retrieved 17 August 2018. ^ "MARD KO DARD NAHI HOTA". Rottentomatoes.com. Retrieved 23 March 2019. ^ a b c d e Khan, Faizal (19 October 2018). "Midnight superhero". Mint. Retrieved 3 November 2018. ^ "Abhimanyu Dassani trained in martial arts for debut film". The Times of India. 21 July 2018. Retrieved 17 August 2018. ^ Purkayastha, Pallai Dey (28 September 2018). "Action director Prateek Kumar talks about his acting debut in 'Mard Ko Dard Nahi Hota'". The Times of India. Retrieved 4 October 2018. ^ a b "Radhika Madan reveals why she chose Mard Ko Dard Nahi Hota over Laila Majnu". Times Now. 27 October 2018. Retrieved 1 November 2018. ^ Taran Adarsh [@taran_adarsh] (11 February 2019). "All set for 21 March 2019 release... First look poster of #MardKoDardNahiHota... Stars Abhimanyu Dassani... Directed by Vasan Bala... Produced by Ronnie Screwvala. t.co/X2jGXfIFJX" (Tweet) – via Twitter. ^ Zee Music Company [@ZeeMusicCompany] (11 February 2019). "Yeh mard ka ek hi formula hai - paani toh peete hi rehna chahiye! Aa raha hai 21st March ko cinemas mein. #MardKoDardNahiHota" (Tweet) – via Twitter. ^ "Mard Ko Dard Nahi Hota - Official Trailer - Abhimanyu D, Radhika M - Vasan Bala". YouTube. ^ "Mard Ko Dard Nahi Hota - Original Motion Picture Soundtrack". Jio Saavn. ^ Motamayor, Rafael (17 September 2018). "[TIFF Review] 'The Man Who Feels No Pain' is India's Highly Entertaining Answer to 'Deadpool'". Bloody Disgusting. Retrieved 21 September 2018. ^ Hurtado, J (18 September 2018). "Toronto 2018 Review: THE MAN WHO FEELS NO PAIN, A Big Screen Love Letter To All Things Action". Screen Anarchy. Retrieved 21 September 2018. ^ Hurtado, J (3 January 2018). "J Hurtado's 14 Favorite Indian Films of 2018". Screen Anarchy. Retrieved 4 January 2019. ^ Leydon, Joe (17 September 2018). "Vasan Bala's action-adventure fantasy pivots on the efforts of a young man eager to transcend his limitations to become a martial-arts hero". Variety. Retrieved 22 September 2018. ^ Dalton, Stephen (21 September 2018). "'The Man Who Feels No Pain' ('Mard ko dard nahi hota'): Film Review: TIFF 2018". The Hollywood Reporter. Retrieved 25 September 2018. ^ Desai, Rahul (27 October 2018). "Mard Ko Dard Nahi Hota Movie Review: A Whimsically Joyful Ode To A Life Of Movies". Film Companion. Retrieved 1 November 2018. ^ Menon, Pradeep (17 October 2018). "Mard Ko Dard Nahi Hota movie review: A cocktail of gorgeous action sequences, absurd laugh-out-loud moments". Firstpost. Retrieved 1 November 2018. ^ Sharma, Devesh (20 March 2019). "Movie Review: Mard Ko Dard Nahi Hota". Filmfare. Retrieved 20 March 2019. ^ Sen, Raja. "Mard Ko Dard Nahi Hota movie review: The most entertaining action movie in decades. 4 stars". Hindustan Times. Retrieved 21 March 2019. This page was last edited on 18 April 2019, at 14:09 (UTC).